Adam is one of the longest serving eCollect staff members. He started his career in banking and financial planning working with one of the major banks before joining eCollect in 2007. 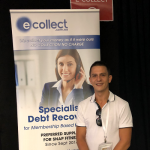 Adam takes the lead role in eCollect’s gymnasium collections and specialises in improving the collection process to accommodate higher volumes so that we can continually obtain better results for our clients. The Bunderla family have a major presence within eCollect with Adam’s mother, father and partner all being involved within the business. When Adam is not taking care of his clients, he enjoys spending time with family, the footy, going to the beach and having a round of golf.